Libby on the Label: #52 Ancestors Week 46 - "Random Fact"
#52 Ancestors Week 46 - "Random Fact"
I learned a new random fact today. My great grandfather, Archibald Park, had one leg that was much shorter than the other. My aunt (his granddaughter) remembered his routine was to take off his shoes and lie down on the couch after a long day. One of his shoes had a 3 or 4 inch heel so that when he stood he could walk normally. She also remembered he would keep a spittoon nearby and used it often.😝 I haven't found any pictures of him, but she says she can remember his white beard and hair as clear as day and that she could draw a picture of him. Hahaha. I found a really random piece of documentation concerning my 5th great grandfather Joseph Button. Apart from his will, this is the thing best piece of information I have when it comes to him. I found it in the U.S., Craftsperson Files 1600 -1995 on ancestry.com. 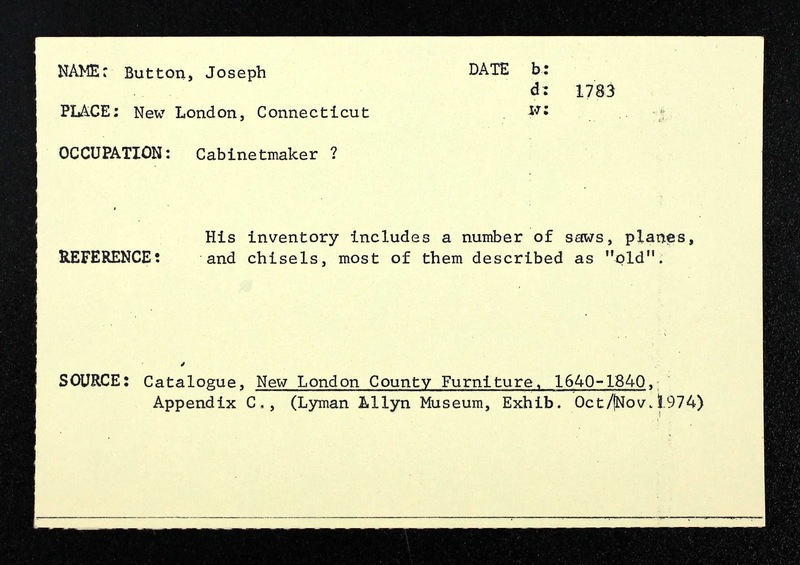 It's a Card File of American Craftspeople, 1600-1995. The Lyman Allyn Museum in New London, Connecticut contains regional art and artifacts from 1600 - 1900. Their permanent collection includes an 18th century New England furniture collection, including many examples of New London's unique variations. Apparently in 1974 there was a more focused and detailed exhibition of New London county's furniture. Joseph Button's cabinet making tools were a part of that exhibition. His inventory included a number of saws, planes and chisels, most of them described as "old". The Lyman Allen Museum looks interesting. A link to their website is here. I used to live in Connecticut and never knew that I had ancestral links there. It is such a beautiful part of America that maintains a connection to it's colonial heritage. The next time I go for a visit, a day at the museum is on the to-do list.